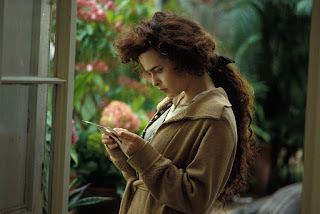 Howards End is set nearly a century apart and released two years before Four Weddings and a Funeral, but there’s a remarkable similarity in the style of storytelling and the casting of this Ismail Merchant/James Ivory film that has been recently restored and is now being screened in cinemas as a 4K digital print. We’re slowly introduced to the three different family units with their different social backgrounds and their different relational dynamics before their lives are gradually allowed to meld together. 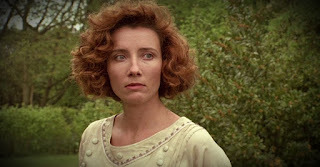 The adaptation of E. M. Forster’s novel starts with an unexpected and unapproved announcement of an engagement to a young Wilcox lad that sends an old Aunt (Prunella Scales) racing off to the titular house in the country to investigate. Totally without any sense of farce, Helen (Helena Bonham Carter) simultaneously travels back to London, having back-pedalled on the romance. It’s a totally female led film. Emma Thompson is marvellous as Margaret Schlegel, playing Helen’s older sister who runs her socialist-leading household with a pragmatic level-headedness, a touch of confident feminism and a need to interfere in other people’s lives. Practically every male on screen is a bit of a disappointment: I half expected Hugh Grant to appear before the end. While the giddy and progressive Schlegels are well off, they are not rich. The wealthy upper class Wilcox family move in across the road and soon we also become acquainted with Jacky (Nicola Duffett) and Leonard Bast (Samuel West) who live in a flat in the shadow of a railway track and inject disruption into the storyline. A death leads to the Wilcoxes colluding to deceive the Schlegels about a possible inheritance, but circumstance slowly unravels the wrongdoing Henry Wilcox (Anthony Hopkins) grows close to Margaret Schlegel, throwing complex mixed motives at the minds of the audience. Gentle humour accompanies the well-signposted misunderstandings. Heart strings are never seriously pulled. But there are many moments of awkwardness and social distress as class and convention rub up against expectations. And there should be sadness when justice for the most impoverished can only be found after death. The many familiar cast members look frightfully young. While the story telling feels more modern than the turn of the 20th century setting, the strange fade-to-black that is used to jump forward in time within a scene must have jarred as much in 1992 as 2017. The 4K conversion looks sharp and faithfully maintains the brown and amber tint of the original colour palette. Occasional artefacts jump out, like the butter-coloured speckled wallpaper that momentarily has a distracting moiré effect towards the end of the film. Very long (142 minutes) and without any tear-jerking moments of surprise, Howards End could have been a damp squid of a film. Yet Ruth Prawer Jhabvala has successfully translated a well-constructed plot from paper page to silver screen and together with the quality of the acting and the sumptuous sets and costumes delivers an engaging and satisfying film. 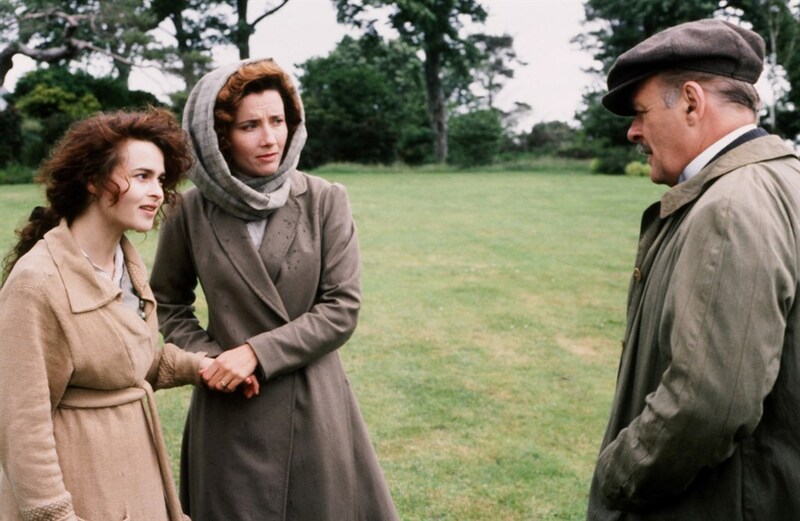 You can catch the restored 4K print of Howards End at the Queen’s Film Theatre until Thursday 3 August. 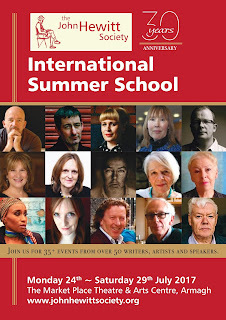 Borders, Brexit and Dreams are recurring themes in this year’s John Hewitt International Summer School which runs between Monday 24 and Saturday 29 July in The Market Place Theatre in Armagh. 2017 is the 30th anniversary of the John Hewitt Society, and this year’s event features 55 artists, writers and speakers participating in 35 or more events over the six days. 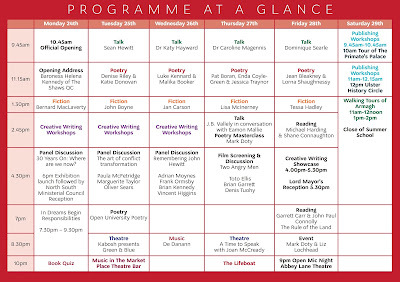 On top of the creative writing workshops and masterclasses, there’s a rich set of talks and panels looking at contemporary politics and culture. 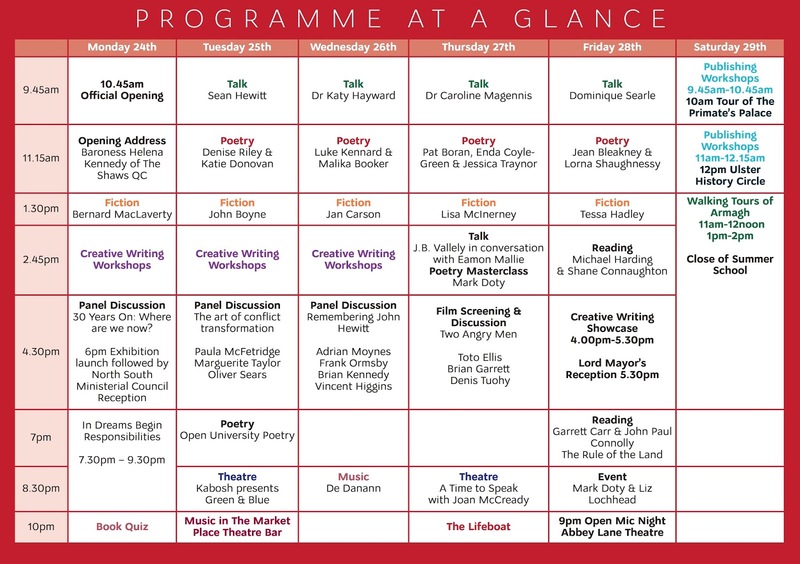 Some events are already sold out, so worth checking The Market Place Theatre website or box office before travelling down to Armagh. The opening address on Monday morning will be delivered by Dame Helena Kennedy QC, a barrister and broadcaster who champions civil liberties and promotes human rights. As a Labour peer, she currently holds the record of rebelling more frequently that any of her other party colleagues in the House of Lords. She recently appeared– quite frustrated – on screen in Laura Poitras’ documentary The Risk that profiled Julian Assange. Monday afternoon’s panel discussion asks 30 Years On: Where are we now? Seamus Mallon, Naomi Long, Steve Aiken and Steven Agnew will be in conversation, chaired by Peter Osborne. The opening night’s gala event reprises In Dreams Begin Responsibilities: A Journey in Words & Music. 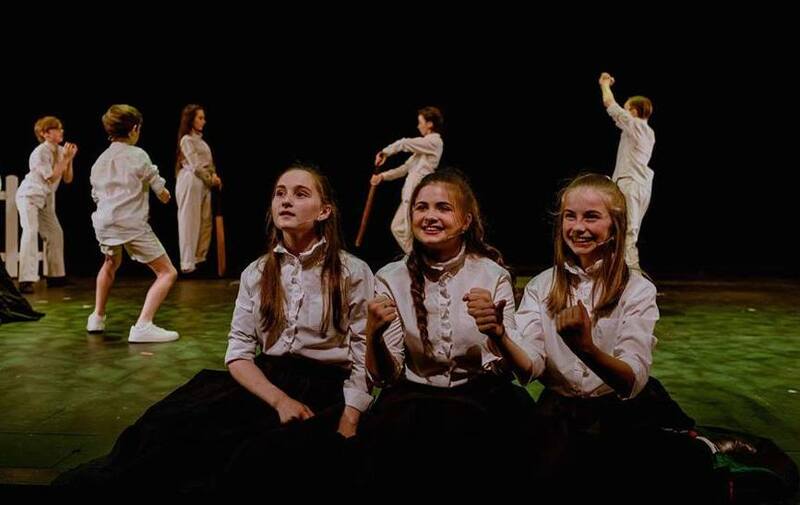 First staged in the Dublin Abbey Theatre and at Belfast Festival last year, the show features a selection of the island’s finest and most respected artists as they look back over the last century and chart the journey of reconciliation from 1916 to the present day through poetry, music, drama and imagery. Tuesday afternoon’s panel discussion looks at The Art of Conflict Transformation with Katy Radford, Paula McFetridge, Marguerite Nugent and Oliver Sears. On Tuesday evening evening, Kabosh Theatre will perform Green & Blue, a play that looks back at border policing using Garda and RUC officers’ oral history. One of the most memorable pieces I reviewed during last year’s Belfast Festival, a thoughtful and respectful play that is worth catching. Political sociologist and border studies expert Dr Katy Hayward will discuss the future of borders – frictionless and otherwise – on and around the island of Ireland after Brexit in her Wednesday morning reflection. Friday morning continues the theme of borders with Dominique Jan Searle talking about The Garlic Wall and the border separating Spain from Gibraltar that was closed between 1969 and 1985. Dominique is the Gibraltar Representative to the UK and will talk about the human and political factors behind the dispute with Spain and how the future management of the frontier will be affected by Brexit. Borders also return on Friday evening with a reading from Garrett Carr’s recently published book The Rule of the Land which documents his walks along the border that separates north from south. He’ll be joined by John Paul Connolly who voiced the book when it was adapted for Radio 4. Half a Sixpence is the rags to riches tale of Arthur Kipps, an orphan who is separated from his childhood friend Ann and becomes an apprentice in a Folkestone drapery shop. Can the cockney couple rekindle their friendship? 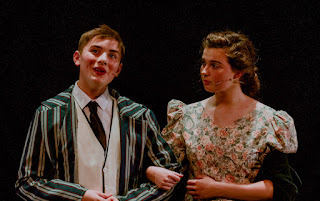 Or, egged on by an aspiring thespian, will the young lad’s attention be distracted by high society Helen Walsingham who runs evening classes for the underprivileged in the “town of vulgar prosperity”? Throw into the mix a sudden fortune and a few swipes of fate and you have a two hour, class-riven musical with song, dance, and costumes galore. 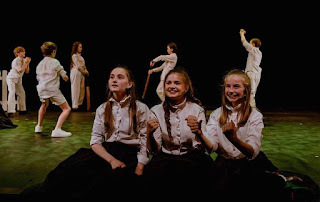 With a cast of thirty 8–16 year olds, and only two weeks of rehearsal, director Peter Corry together with choreographer Gemma Quigley-Greene, musical director Thomas Brown and the back stage crew pulled off a minor miracle with the nearly word-perfect musical which had two public performances earlier this week. Other than pantomime, the size of Northern Ireland audiences and venues dictate that very few performance have more than six actors in a production. So it was a treat to have the MAC’s stage full of colourful talent for this Belfast School of Performing Arts summer show. Fresh back from The Voice Kids UK, Nathan Johnston’s voice found its confidence part way through the first half to deliver a sure-footed performance (that included tap dancing!) in the lead role which kept him on-stage for virtually the whole show, singing in nearly every number including solos and duets. Victoria McClements blended her voice beautifully with Kipps/Johnston during Ann’s duets and delivered a stunning solo I Know What I Am, keeping up the Cockney accent throughout the entire show. Her rival Helen Walsingham was played by Leesa Seffen, at first gracious and kind before toughening up under the influence of her stern mother (Ellen McAdam). Glenn Parkinson’s camp Harry ‘Biff’ Chitterlow had the audience roaring with laughter (even when only his silhouette was visible pulling the curtain across the stage in the dark). Four junior narrators provide frequent updates for anyone in the audience who has missed a vital plot point. 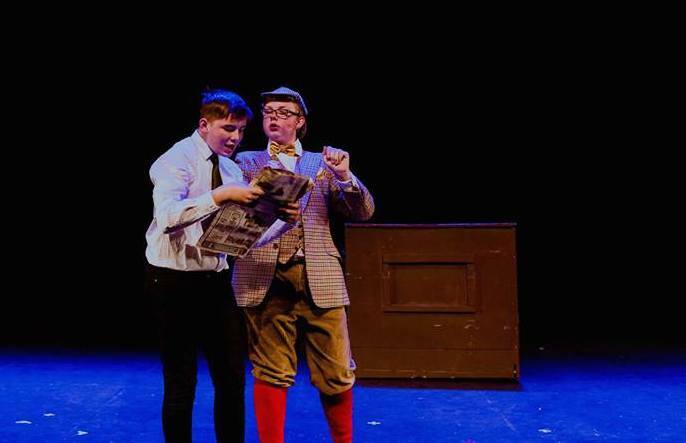 Louis McCartney and Young Walsingham Michael Nevin (about takes up his scholarship at Winchester College Chapel Choir in September) deserve a mention as talented trebles who also added much to the humour of the show. Peter Corry didn’t often let the action drop its pace, creating a remarkably tight and ambitious production. The live band hidden behind a curtain at the back of the stage stayed within earshot of the performers and some beautiful trumpet tones cut through above the rest of the soundtrack. The Half A Sixpence musical that I sat through several times as a child – enjoying performances by Ulster Operatic and other amateur groups – was revamped in 2016 and the version performed on the stage of the MAC this week is substantially less dated, while maintaining the turn of the last century feel of HG Wells’ novel Kipps: The Story of a Simple Soul. 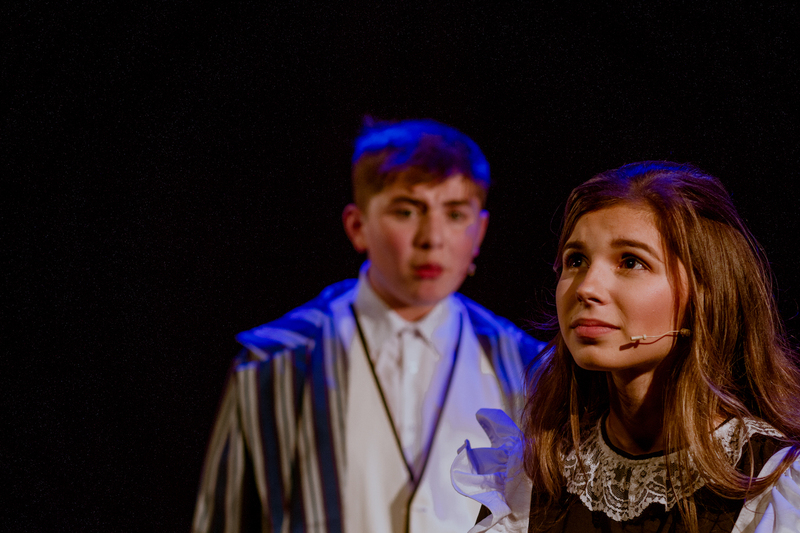 BSPA’s junior summer show was quite a treat, and the standard of the ensemble as well as the principals bodes well for the health of musical theatre in Northern Ireland. Keeping up the Tommy Steele theme, BSPA will be back in the MAC between 23 and 26 August with their senior show: Singin’ In The Rain. The creative hands of Christopher Nolan are all over his new film Dunkirk as writer, director, producer and even arbiter of the distribution media. It reanimates the history books that describe the days in 1940 when victory snatched from the jaws of defeat as upwards of 300,000 soldiers were evacuated from the beaches of Dunkirk where they had been trapped, surrounded by the German Army and being picked on by the Luftwaffe. Nolan follows a handful of key characters. But unlike most disaster films, we never find out much about their back story or motivation. They’re just familiar faces there to juxtapose, and help weave together, the different strands on the ground, at sea and up in the air. The film begins with Tommy running through the streets of Dunkirk, under fire. The soundscape is intense. And as the young soldier ducks behind the sandbags and reaches the beach, the visual width opens up and the scale of Nolan’s vision is revealed. A young boy jumps on board his friend’s father’s weekend boat to help the war effort and sail to Dunkirk to rescue the troops. This storyline brings the civilian population into an otherwise military sphere of operations. Spitfire pilots defend the skies above the beaches being evacuated and try to protect the mixed flotilla of vessels sailing towards France. Military officers assess the chances of survival and debate the times of the tide (leading to the gratuitous but funny line “it’s a good job you’re army and I’m navy”). Kenneth Branagh stands on a pier pulling excellent faces for despair, hope and resolve. 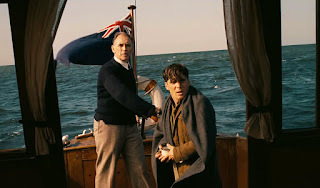 Mark Rylance sees the bigger picture as he holds his pleasure cruiser’s course for France despite protestations from a very disturbed Cillian Murphy who us rescued along the way. Fionn Whitehead plays a central army private along with Harry Styles (yes, that Harry Styles). Up in the air, Tom Hardy and Jack Lowden are anything but gung-ho in their dogfighting Spitfires. There is as much fear and cowardice on display as heroism. Survivors often seem to be driven towards self preservation, making the luck that propels them towards staying alive (even at other people’s expense). After a while it becomes nail bitingly tense, and even through the success of the evacuation by sea is known by most before they enter the cinema, the feeling of defeat in the hearts of the returning soldiers adds a poignancy to the tale. The action is self-explanatory and dialogue is used sparingly. Often the soundtrack and music are given priority and allowed to wash over the spoken words anyway. Hans Zimmer uses the mechanical groans of distress that emanate from torpedoed ships to sustain the beat. Nolan messes with time, stretching and compressing it to fit the rhythm of his plot. It only becomes annoying at the end when he brings together the returning armada and a vulnerable plane (which glides nearly as long as the boats motor back across the Channel). It’s a brave departure from his back catalogue of blockbuster films. There are no superheroes. 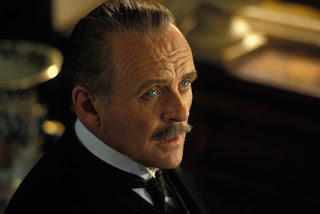 And it is perhaps cowardice on the great director’s part that he gives in to using the familiar strains of Elgar’s Nimrod (albeit at first disguised) to underscore some key scenes, bringing a smidgen of jingoism to a film that didn’t require it. Dunkirk is a stunning piece of cinema that recreates and brings to life a well known scene from the Second World War. Despite the scale and sophistication of the production, it stays unfussy to the point of modesty and only stays on screen for 106 minutes, allowing the evacuation story to keep the focus rather than the fine cast. A grown-up film from Mr Blockbuster. Queen’s Film Theatre are showing the 35mm print version of Nolan’s film for the first week of its run until Thursday 27 July. With soft edges, artefacts, and a colour scheme that today feels straight out of an Instagram filter, the experience adds to the realism of footage that could have been captured during wartime. (That’s the version that was previewed and the basis of this review). 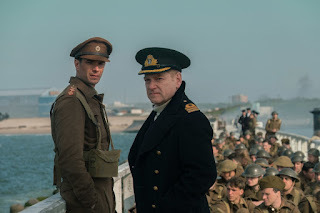 After the first week, the QFT switches to the 4K digital version – using their shiny new projector – and having seen a few minutes of Dunkirk in 4K, it’s quite a different film, with a much sharper, more modern, action adventure feel and much more definition to the surround sound. Dunkirk is being shown in the QFT (and other local cinemas) from Friday 21 July. It’s history that has not been narrated within an inch of its life – or truth – and history that, while told only from an Allied perspective, has not been wrapped in a large flag that distracts from the horrible reality of war and the decisions people take in war. Christopher Nolan should be proud of this film: it may well be his best. 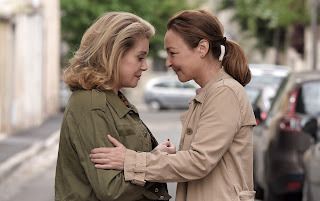 Martin Provost’s new film The Midwife (French: Sage femme) is a Parisian collision of beginnings and endings. Béatrice Sobolevski (Catherine Deneuve) was once an important figure in the family life of Claire Breton (Catherine Frot) and reappears after a thirty years absence. Friendless and challenged by a serious health condition her plan to rebuild burnt bridges with Claire’s father is tragically belated. Meanwhile at the same time as Claire’s job in the midwifery clinic is coming to an end – being replaced by an industrial-sized technology-led ‘baby hospital’ – there is a pregnancy in the family and could a tender friendship be blossoming in the allotment? The two Catherines play very distinct characters. Frot is the dowdy and dedicated medical practitioner who can disarm scared young mums and stays calm in an emergency. She earns little, lives alone and relies on no one. On the other hand, blunt and glamorous Deneuve is not alone by her own choosing. She keeps the company of poker players and drinkers in the bar – both of which explain why her cashflow ebbs and flows like the tide – but knows that those shallow relationships will not sustain her in her frail final days. The premise is simple, but the film is well executed. There’s no wow factor, other than the babies popping out. But there is a sense of satisfaction as Claire develops a renewed sense of purpose, emotionally and physically letting her hair down, while Béatrice more fully comes to terms with the consequences of her past actions and faces up to her mortality. The Midwife is being screened at the Queen’s Film Theatre from Friday 14 until Wednesday 26 July. In a cruel twist of fate, after the virus outbreak (and the intervening films) the only remaining humans are all North American and hell bent on self destruction, distracted only by their desire to attack the apes who hold a mirror up to fallen humanity. Can Caesar – the chief ape – lead his people to the promised land? And unlike Moses, will he make it all the way? Nature throws some shapes of its own to remind the mammals that other powerful forces are also at play in War for the Planet of the Apes. As someone new to the Planet of the Apes universe, this 140 minute film was a strange mix of a Bourne, some Biblical exodus movies, the Revenant, the Godfather, the Great Escape and Three Men and a Little Lady. Scenes of genocide, forced migration and combat are mixed with a comedy ape who escaped from a zoo. 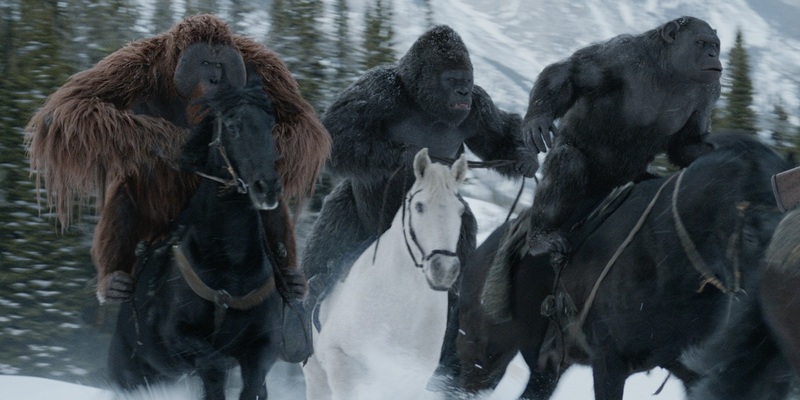 Writer Mark Bomback and returning director Matt Reeves through an awful lot at the script: resistance, fortitude, sacrifice, revenge, betrayal, slavery, rebellion, ethnic cleansing, not to mention apes on horseback riding through the snow. Intellectually, there’s a lot going on in War to think about. Arrows can beat bullets just like steam can beat electric in Starlight Express. 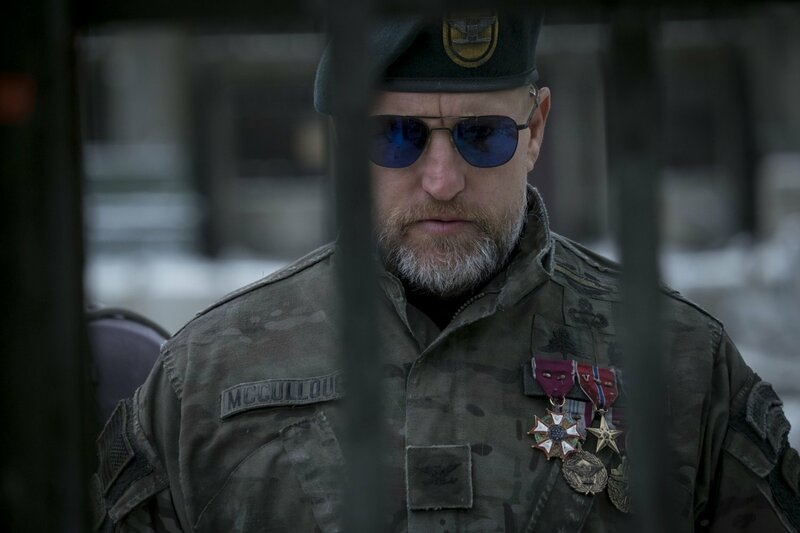 Emotion is explored as the obsessed Colonel McCullough (played by Woody Harrelson) who is prone to primitive thinking becomes locked into a fight to the death with Caesar (Andy Serkis) who has to battle with avenging his own family loss. Communication within and between species is also studied – spoken and signed – though the loss of speech seems to be unnaturally devastating for some humans. In one of the sweetest moments in the film a young child (Amiah Miller) slips around unseen in a heavily militarised zone. No one’s looking for her; no one sees her. I find it interesting that her ‘guardian’ ape Maurice, who has perhaps the greatest emotional intelligence of the troop, is played by a woman actor (Karin Konoval). But oh the questions and loose ends that litter the movie like bodies piled up after an incursion. Where are all the women? What powers the army camp? Why does Caesar speak in English when the apes around him only speak by sign? Who carries the spare bullets? We need to talk about 3D. I don’t watch usually films in 3D. I think this is only the second time I’ve sat in a darkened cinema while wearing dark plastic shades. We’re very used to capturing images on smart phones where nearly everything in the frame is in focus. The world is flat unless you use macro lenses or fiddle with the settings a lot more than the average user. Television and film drama relies on depth of field, and pulling focus between nearby and faraway objects. Even news reports use focus to draw your eye from one area of the screen to another as the cameraman helps the narrating journalist paint a story about the topic. But 3D cinema takes focus to a whole new dimension. No longer can you scan across the wide screen in front of you to take in details. It’s not just bits of the background that are kept out of focus. With a 3D film like War for the Planet of the Apes, often a head or a shoulder of an ape that is in-between you the viewer and the ape that’s talking will be a furry blur too. The director and the camera man literally call the shots. 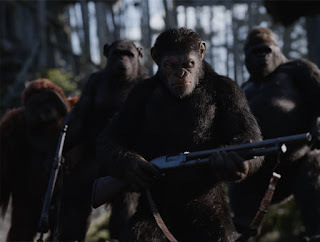 War for the Planet of the Apes will be screened in Movie House cinemas in 2D and 3D (and other big chains) from Tuesday 11 July. Laura Poitras had already been filming behind the scenes with WikiLeaks and Julian Assange when Edward Snowden’s release of NSA information hit the headlines. She was embedded with the team that helped Snowden evade US authorities and travel to Russia. That part of her footage was extracted into the successful standalone film CitizenFour (reviewed) and released in late 2014. Filmed over five years, Risk is like prequel and a sequel to that story. However, Snowden is a relatively straightforward, clean cut character who can attract audience empathy in a way that the more complicated Assange cannot. At first Poitras portrays a principled and pragmatic publisher of government secrets who admits that he may not behave in a “methodical manner” when subjected to threats. Then a layer of the onion is peeled away to reveal a paranoid protester who must have a crick in his neck given the number of times he looks over his shoulder while being briefed by a colleague in a wooded area near the WikiLeaks HQ. ‘Being briefed’ is misleading phrase for me to use: Assange frequently interrupts those who speak to him. It’s one of the traits that jumps out from the 92 minute film. He is unable to suppress his own thoughts escaping his mouth while he is supposed to be listening to someone else. And then there’s his startling lack of empathy for other people, including the women who made the allegations of sexual assault. He dismisses the complaints and investigation as a radical feminist conspiracy. Suddenly he’s on the wrong side of this conspiracy. The onion continues its raw reveal as we realise that although WikiLeaks is a small organisation, this is a boss who lets other people dial the numbers and start phone calls before he reaches over to take the handset. His team trim his hair, and even when closeted in his cramped quarters in the Ecuador embassy next door to Harrods in London (June 19 was his fifth anniversary), he is surrounded by WikiLeaks staffers. One of his most trusted aides, Sarah Harrison, was unable to return to the UK for several years after helping Snowden flee to Russia. Yet we hear no complaint. Loyalty within Camp Assange is high. One side effect of the extended period of filming is that some of the long-running characters disappear (like a soap opera). Jacob Appelbaum (journalist, hacker and computer security researcher) is at first prominent, speaking at conferences about WikiLeaks and challenging government figures, before making a quick exit from the scene (and his involvement with the Tor Project) when allegations of sexual abuse were made. The case of Bradley Manning (who transitioned to Chelsea Manning over the course of the documentary’s timeline) is also woven into the general tapestry of discordant digital rebellion along with visits to Washington, Tunis and Egypt. Footage of Lady Gaga interviewing the white-haired crypto-journalist is surreal. While never, or rarely, appearing on camera herself, Laura Poitras has chosen to narrate the film through a series of production diary extracts. The story she tells is bitty. The chosen end point is no better – and no more conclusive – than if the film had stopped ten or fifteen minutes earlier. We see the risks that WikiLeaks staff take in their pursuit of publishing the ‘truth’. We see the risks some may have taken outside of their work. We are also introduced to the risk being taken by the filmmaker who has triggered government agency trip wires and is now viewed as a sympathiser if not a direct advocate for WikiLeaks. 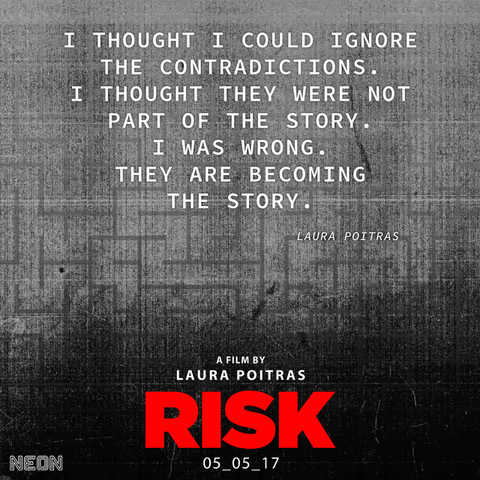 At points in the film, Risk feels both unsatisfactory and uncomfortable. As a consequence it successfully reflects the WikiLeaks organisation and its leader Julian Assange. The film no where near as complete and finished as CitizenFour. And Assange is no where near as likeable a subject as Snowden. But Risk is a good overview of the Assange era, even if his story – and incarceration in the Knightsbridge diplomatic mission – has not reached a neat conclusion. 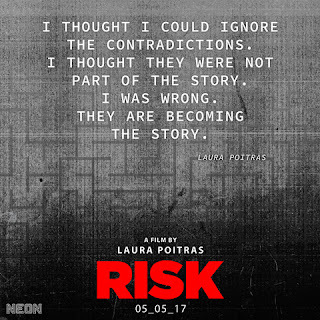 If WikiLeaks made films about people doing things they didn’t like, Risk contains exactly the moments that they would include to shake the trust the audience would have in their subject. Laura Poitras has certainly done nothing to give Julian Assange hero status, nor has she rescued his reputation. The uncompromising documentary highlights his aloofness and the contradictions in his approach. Risk is being screened in the Queen’s Film Theatre until 6 July.